Wrike is a digital work management tool that lets users track and coordinate projects, combining a simple user experience and interface with enough depth for power users. The software, created in 2006, is the brainchild of Write CEO Andrew Filev; at the time, he was in charge of a fast-growing consultancy business with a remote workforce. Wrike officially launched the following year. Wrike has since attracted 18,000 customers, supporting more than 2 million users in total. Among companies now using Wrike are Airbnb, TGI Friday and Jaguar Land Rover. The San Jose, Ca. company recently got a majority investment from Vista Equity Partners and has 700 staffers working in six international offices; the company hopes to double its headcount in the next three years as it expands golbally and ramps up efforts to attract enterprise customers. Recently it has begun working to tailor the application to more specific use cases, with recent updates, for instance, of Wrike for Marketers. Launched in 2016, it’s aimed at helping professionals collaborate on asset creation and the delivery of marketing campaigns. 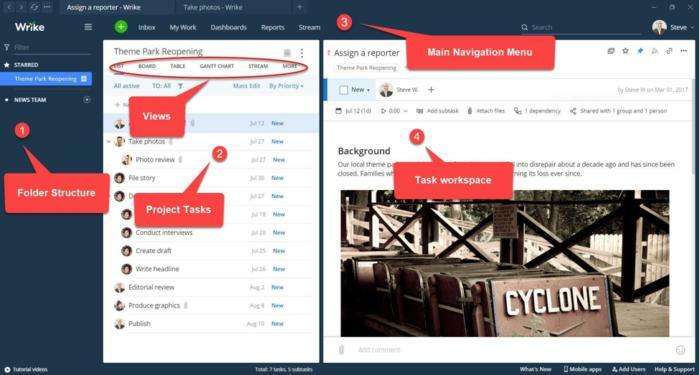 Wrike is focused around three main functions that users with interact with: folders, projects and tasks. Folders are the overarching structure for organizing projects, like building a website or launching a new product, and can be segmented into sub-folders, such as a pre-planning phase, for example. Within each project are tasks, which outline specific actions to be completed as part of wider goals. A project owner can assign tasks to individuals or to multiple team members, set due dates, add file attachments, and provide a more detailed description of the work to be carried out. Team members can leave comments on folders, projects and tasks with @mentions and by posting emojis. 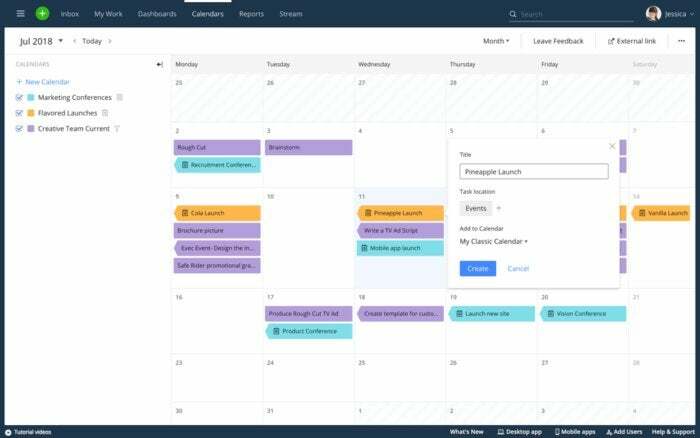 Each user has an inbox for notifications and real-time communications, a personal MyWork view that highlights assigned tasks, and a dashboard used to filter task lists, calendar and analytics. Wrike also provides a range of visual methods for tracking the progress of work while it’s under way. This includes kanban-style boards, a list view, spreadsheet tables and Gantt charts. Wrike already integrates with a wide range of third-party applications, including Slack and Microsoft Teams, Box, OneDrive and Salesforce, and offers an API to connect the app with existing workflows and software a customer might be using. “We are not building a project management system, we are building a digital workplace, and that means connecting different teams and it also means connecting different tools,” said Filev. There are also connectors for business intelligence tools such as Tableau for large businesses to integrate different sources of corporate data. Wrike is available on mobile devices (for Android and iOS), and as a desktop app for Windows and and macOS. Wrike competes with a variety of project and task management tools in a market that was worth $2.27 billion last year, according to a report from MarketsandMarkets. Among these rivals are Microsoft Project and Planner, Workfront, Asana, Smartsheet, Liquid Planner, monday.com, Jira, Trello and Clarizen. 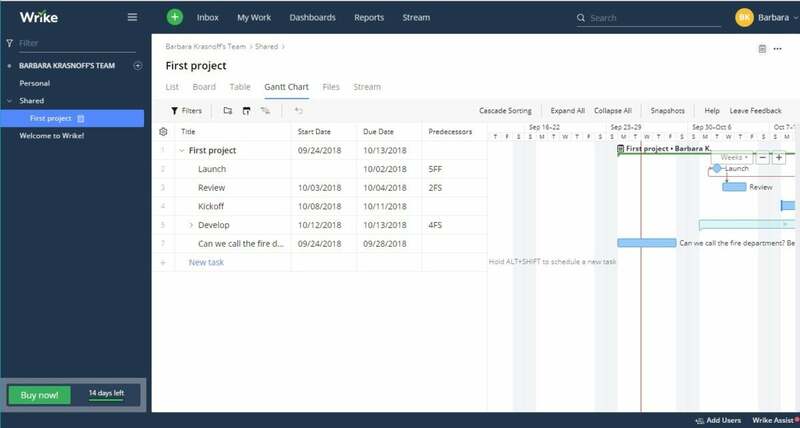 The software is designed to provide more in-depth functionality than a task management application like Trello, said Filev, while staying accessible for a wider spectrum of users compared to more heavy-duty project portfolio management tools. Filev's ultimate goal is for Wrike to be the coordination and management platform of choice for all digital work. With this in mind, he said that Wrike is aimed at all types of knowledge workers – there is growing use among other workers, said Filev, such as those in construction – and it supports both complex tasks and comparatively lighter uses. It’s designed for workers ranging from day-to-day users to managers snf up to C suite, he said. “We are not necessarily the simplest tool on the market – period – but among the most powerful tools we are the simplest. And the way we achieve that is through flexibility in the platform,” said Filev. 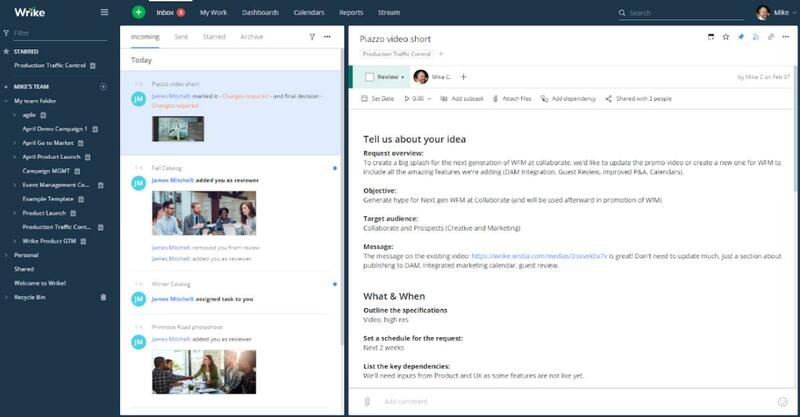 In a report on collaborative work management tools, Forrester principal analyst Margo Visitacion last year included Wrike as one of the three market leaders, along with Smartsheet and Asana, and cited the app's collaboration capabilities and well-designed UI. Ease of use and flexibility are other strong points for Wrike, Visitacion said. But more can be done to ensure that Wrike is an option for a larger range of users, said Kurtzman. “They need to continue to broaden their appeal to people who don’t normally think of their work in project form, as well of those who often are the exceptions to a given process,” he said. There are five payment tiers for the software. A 14-day free trial is available for up to five users. This provides access to some of the core app features – such as task management, file sharing and board view – with some restrictions, such as the number of integrations allowed and the amount of storage space. Wrike Professional includes all of the features of the free tier and adds more functionality such as Gantt charts and shareable dashboards, as well as higher levels of storage and more integrations. Wrike Professional is available for up to 15 users and costs $9.80 per user/month. Wrike Business bumps up the range of features, integrations and storage and costs $24.80 per user/month for as many as 200 users. Wrike’s Enterprise tier (pricing is available upon request) provides a range of security, management and compliance features targeted at IT admins, such as Active Directory integration, SAML 2.0 single sign-on and two-factor authentication. Those add-ons include Wrike Proof, which lets users provide feedback and make edits on a range of content types, and Wrike Publish, a digital asset management integration. Pricing is available upon request. The Professional version of Wrike doesn't offer just board (Kanban), table and list views, but Gantt chart views as well. 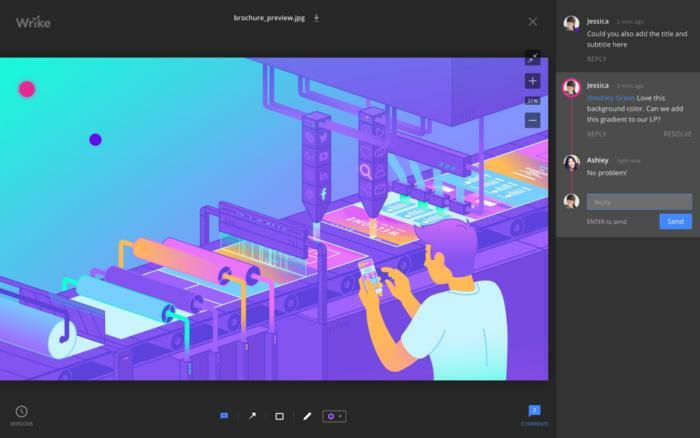 Like many modern digital workplace tools, Wrike initially gained a foothold at smaller businesses and among startups, as well as individual teams within larger organizations. Some of Wrike's larger customers are starting to roll the app out more widely across their business, said Filev. “What happened in the past several years is that those pockets in large enterprises started to grow and grow where we are starting to cover the whole departments or business units, or even in some cases wall-to-wall deals,” he said. Visitacion agreed that enterprise adoption of Wrike is accelerating as work management tools become more commonplace. “Companies are realizing that they can drive greater adoption from CWM [collaborative work management apps] that has broader user appeal over traditional PPM [project portfolio management tools] that target power users,” she said. Filev said that security is a major consideration for businesses considering wide-scale rollouts of collaborative work management tools. That will be an important issue for the company going forward. “We view security as one of the ways to unlock it for enterprise-wide deployments,” he said. To that end Wrike this week launched a series of security features, including Cloud Access Security Broker (CASB) integration support, customized access roles, access reports and Wrike Lock, an enterprise key management feature.